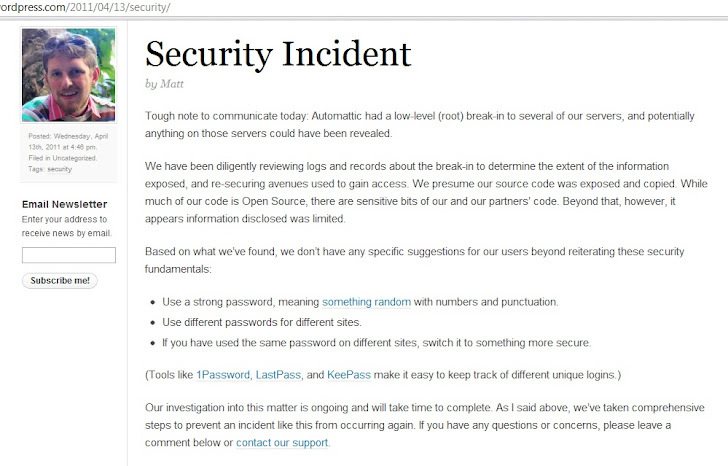 WordPress.Com Hacked, Hacker root the Server ! The parent company that operates WordPress, made an announcement this morning that it has hacked, resulting what the company said was a low-level (root) break-in to several of their servers. The company warned that potentially anything on those servers could have been revealed to the attackers, including client source code. • Use a strong password, meaning something random with numbers and punctuation. • Use different passwords for different sites. • If you have used the same password on different sites, switch it to something more secure.